Why do I need a Multi-Effects Pedal? Multi-effects pedals have always offered incredible practicality and choice. But in the past, they were not the best option in terms of sound quality. 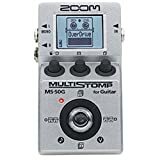 The best guitar multi-effects pedals offer not only practical advantages of multi-effects pedals and processors, but you also get amazing sounds as well. We are going to discuss the benefits these pedals can bring to your guitar playing and the top pics for the best multi-effects processors / pedals on the market today. Before you buy one, be sure to read on to find out what you can do with them, and some very important considerations. We’ll start off by looking at four of the best multi-effects pedals and processors in the $1000 price range. The first is the Helix LT, the smaller and more affordable version of the Line 6 Helix Floor. Helix has included the same dual DSP HX modeling engine in both units. Giving the LT the same quality amp and effects modeling capabilities, as the more expensive Helix Floor. Featuring over 100 effects, the number of sounds that can be created and manipulated is endless. It also features a complex signal routing system. Allowing even further experimentation with the orders and combinations of different effects. As for modeling, you can mix and match between 62 different amplifiers, 37 different cabinets, and 16 mic positions. In contrast to all this complexity, Line 6, designed the interface to be as simple and intuitive as possible. Using a colored LCD display with colored LED rings. It’s perfect for any guitarist who wants a huge variety of quality effects and sound. But doesn’t want to spend days and days reading a manual and learning how to use a multi-FX processor. The tonal quality and versatility. TC Electronic became a major player in the world of effects with their industry standard rackmount delay unit. The hallowed TC2290. Every serious studio in the world has one (or more), and its use on legendary songs is well documented. So it is fair to say, that the TC Electronic knows delays better than most, if not anyone. But they also produce one of the worlds most widely used studio reverb units. As well as, one of the most commonly used rackmount chorus units. I’m sure you can see where I’m going with all this by now. In terms of effects processors, TC Electronic know exactly what they are doing. So when they decided to manufacture a top of the range floor-mount FX system (or rackmount if you choose to rack it) – The TC Electronic G-System. They got serious. Giving players a transportable system. That featured the same gorgeous delays and choruses that had made the company famous. The effects on this unit are simply breathtaking, I own one and love it dearly. There are no stand out effects, they ALL stand out. It’s simply, a stunning sonic creation. But there has to be a downside. The main one being that the G-System has no overdrive or distortion. The thinking behind it is that most players already have their own particular favorite overdrive and distortion pedals. Or maybe they use the clean and dirty channels on their amps. So why include a feature that most people will not use? I agree with them wholeheartedly. I love my distortion pedals and am more than happy to integrate them with the G-System. A far better option than having to use an in-built overdrive/distortion circuit I don’t really like, and have to put up with it forever. Designed with that in mind, it will also power your pedals for you. And turn them on and off for you, without you needing to go anywhere near them. It also switches the channels on your amplifier automatically for you. If you use a TC Electronic Nova Drive overdrive/distortion pedal with it, you can change any pre-programmed setting you want. With a simple tap of your foot. It’s perfect for any guitarist who loves the best of both worlds, – the best modulation effects you’ll find anywhere, teamed up with the best drive pedals they own and/or can buy – it’s a sonic match made in heaven in my opinion. The sounds of those legendary delays, choruses, and reverbs. Some of the best footswitches you’ll find on any floor-mount unit. No in-built overdrive or distortion so you can use your all-time favorites. Editing the effects can be a little complicated at first. No in-built overdrive or distortion so you have to find one you really, really like and use it with it (or is that really a plus?). Boss, the Japanese pedal giant, has continually pushed the boundary of what is possible with its excellent range of effects products over the years. The GT-1000, their latest, high-end multi-effects processor, continues in this rich tradition. 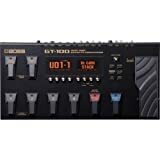 The Boss GT-1000 is a floor-mounted multi-FX processor combining the best of three of their most popular pedals – the RV-500, DD-500, and MD-500. It has a modern, sleek look and typically for the company, has great build quality. You shouldn’t run out of sonic choices. With its 116 effects. And the high-quality 32-bit, 96khz sampling produces a wealth of stunning modulations, delays and reverbs. As well as convincing overdriven and dirty drive tones. Although it sounds great, it’s not the simplest unit to navigate, especially if you’re new to effects programming. It gets easier with practice, but the Helix LT beats it hands-down in this department. It’s also worth mentioning that for players who currently own or are planning to own a more traditional, multi-pedal pedalboard. The so-called ‘Bossfecta’ of the RV-500, DD-500, and MD-500 series units would provide more flexibility, than the GT-1000. It’s perfect for any guitarist who loves the Boss sound. The amp modeling sounds very impressive. Not particularly user-friendly for beginners. It’s not really worth buying if you already own an RV-500, a DD-500, and/or an MD-500. An impressive multi-effects pedal from HeadRush. Offering high-quality amp modeling, enough effects, and a killer touchscreen. With only 33 amp models and 42 effects, the Headrush pedalboard is nowhere near as extensive as some of the processors already covered. But it does have one massive advantage over the rest – its very impressive 7-inch touchscreen interface. This is absolutely superb for editing, especially for beginners to programming effects. Very little effort is required from the first time you use it. And most of the changes to any effect setting only takes a turn of a few knobs. Although limited on the number of effects, most of what you’ll ever need is included. The unit also allows the ability to load custom/third-party impulse responses, Allowing you even more tonal refinement. It also features a looper with a very impressive 20 minutes of record time. Perfect for any guitarist who wants an extremely easy-to-use interface. It also functions as an audio interface. It has fewer effect options than on most of its competitors. The limited number of amp models and routing options. The H9 is an excellent, compact multi-effects pedal, from Harmoniser legend, Eventide. The base model features nine different effects. But you can buy additional effects to continually expand the pedal’s capabilities. The H9 includes the Chorus and Tremolo/Pan from the ModFactor pedal. The H910/H949, and Crystals from the PitchFactor pedal. The Tape Echo and the Vintage Delay from the TimeFactor pedal. And the Shimmer and Hall from the Space pedal. Eventide products have always been massively full-featured with amazing versatility. But along with that came the associated complex editing systems. The H9, however, is still full-featured but far easier to navigate than the companies vintage harmonizers. The free Control Editor App is perfect for editing, creating and managing presets, and changing system setting. You can even use it to purchase more algorithms online. Perfect for any guitarist who wants an incredible sounding Chorus for one song. An amazing harmonizer for another. And the most awesome sounding delay you can imagine, in another but doesn’t want to buy three separate pedals. Eventide sounds for a massive amount less than buying a rackmount unit. The app-based editing is very easily done. Doesn’t allow a number its effects to be used at the same time. App-based editing is great but, not for those without a smartphone. The Keely Dark Side’s concept is keep it simple. Without unnecessary technology, getting in the way of functionality and sound, and ultimately raising the price. The Dark Side is famed for one thing, the sound and the quality of its effects. Its drive circuit is based on a fuzz unit from 1977. Then, continuing the vintage vibe. There is a multi-head delay effect featuring twelve syncopated delay patterns. This is followed by a modulation section featuring a flanger, a u-vibe, a phaser, and rotary speaker effects. Pink Floyd, as is obvious from the name of the pedal, was the inspiration behind the design of many of the effects. So if the David Gilmore guitar sound is the one you’re looking for, you’ve just found your dream pedal. If not, please don’t be put off. This pedal can create amazing sounds in any number of musical genres. As for options, there really aren’t many, it just focuses on a great raw sound and beautiful tones. You can connect an expression pedal if you wish. Or change the order of the effects in the effects chain, creating some interesting variations on the sounds available. But that’s about it. Perfect for David Gilmore, or any guitarist who loves his sound. A great sounding high-end, raw, analog multi-effects pedal. Did I mention how good it sounds? Lacks the variety of effects that many people want from a multi-FX. It’s not very tweakable in terms of changing multiple parts of a particular effect. And here comes another Boss offering, the baby, baby brother of the GT-1000, the Boss GT-1. It’s very impressive that Boss has managed to perfectly fit 3 footswitches and an expression pedal, into such a small footprint. The backlit LCD display finishes it off nicely, making the GT-1 very simple and intuitive to set up and use. Another interesting feature is the ability to run it using four AA batteries. Making this unit a truly portable multi-effect processor. Personally, I’m a little confused by this, for stage use, I don’t really get it, not only because of the expense of continually buying batteries. But who would want to take the risk of losing battery power half-way through the climax of their favorite solo? Alternatively, if you’re supposed to take it off-grid, then you would also need a battery-powered amp to go with it. And as we all know, battery-powered amps don’t sound too good on the whole. ￼￼￼￼￼￼￼￼￼Taking all this into account, it is therefore perfect for, any guitarist who wants to play screaming guitar solos on top of a mountain, miles from civilization. Great sounding effects for the price range. The power supply is not included. Zoom has, as it usually does, attempted to fit as many effects as possible, into the smallest possible space, at the lowest possible price. In this case, that’s a hundred plus effects and 22 amp models with the recent updates to the MS-50G MultiStomp. The pedal allows six of these 100+ effects to be used simultaneously and in any order, which is more than enough for most occasions. The 22 amp models cover the usual bases, three Fender amps – a Tweed Bassman, a ’65 Twin Reverb, and a ’65 Deluxe Reverb. Along with a Vox AC30, a Marshall Plexi, and a Two-Rock Emerald 50. If you want to get down and dirty there’s an Engl Invader and a Diezel Herbert to have some high-gain distorted fun with. On the subject of modeling, the MS-50G also features models of some famous effects pedals, including a Tube Screamer and a Big Muff. Perfect for any guitarist who loves tweaking and wants access to lots of different sounds but doesn’t want to spend a fortune. Surprisingly intuitive interface for the small size. A very wide range of either single or multiple effects. Great sounding modulations, delays and reverbs for the price. The drive tones are nowhere near as good as the other effects. Only a single footswitch limiting functionality. Power supply not included so you’ll need to run it off batteries or buy one. Insanely heavy distortion with full range response. Analog-voiced delay module with rich echo feedback. If you’re looking for a good, basic compact unit combining the three most essential effects and not much more. Then the Donner Alpha Cruncher could be the best multi-effects pedal for you. It’s an analog-style pedal combining distortion, chorus, and delay, which are easily the three most useful effects you’ll ever need. Considering the price, the distortion is good – a classic British style sound. While the chorus is bright and shimmery, and the analog-voiced delay does what it should. The interface is laid out as if three pedals were glued together. With dedicated knobs allowing hassle-free control of each of the effects settings, and three corresponding dedicated footswitches. Simplicity is ￼￼￼￼￼￼what the Donner Alpha Cruncher is all about. No need to navigate layers and layers of menus and press endless buttons to change your delay time. Just turn a knob and you’re done. This obviously has its downside if you want more tweak-ability. But if you don’t then this could be the pedal your looking for. The pedal has countless fans worldwide mainly due to its value for money and its simplicity. And those who like it, usually don’t want anything more complicated. Perfect for any guitarist who doesn’t enjoy constantly tweaking in order to get ‘the’ sound, and is looking for a simple life. Great sounds considering the very low price of the unit. Couldn’t be simpler to set up, use and change sounds. That ever so low price. It has very few adjustments per effect compared to other units. It’s not really worth buying if you already own a distortion, a chorus and/or delay pedal. When I started playing seriously in the 1980s, there were only two effect choices. You could buy one or more pedals, each one producing one effect at a time. Or you could spend a fortune and buy a rackmount studio processor. Allowing more than one effect to be used at the same time. But as the late ’80s and early ’90s arrived, cheaper multi-effect processors hit the market. Offering not only all the sound options our guitar pedals gave us but the ability to program them. This meant that with a single press of a switch, you could introduce a whole new group of settings and radically change the sound – instantly. There was no longer a need to tap dance your way around trying to turn your overdrive, chorus and, delay on or off at the exact same time. These early multi-effects pedals offered immense practicality. Not only in terms of being able to switch many effects on and off at the same moment. But also benefiting from far less set up time, no problems with dead batteries, no banks of dodgy wall warts, etc. etc. All these advantages, however, couldn’t overcome the one major disadvantage. In that, even the best multi-effects processors and pedals of the time just didn’t sound good. So some purists, including me, kept on lugging our pedalboards around. Because I for one would rather, tap dance around like a maniac and have fantastic sounds. Than hit a single switch, in order to change from one terrible sound to another. Then, making life even harder on multi-FX processors, boutique pedals started to become available. These offered guitarists an even greater variety of sounds and higher sonic quality, than the Boss, Ibanez, and MXR pedals we were all using at the time. And far, far better sounds than you could get out of, even the best multi-effects processor. Both these factors caused multi-effects processors to go through a major sales slump. Leading manufacturers to improve every aspect of the products. They re-designed them and greatly improved their ease of use and their functionality. But most importantly of all, they improved the sound. With the rapid expansion of the DSP capabilities of modern processors, they now sound absolutely superb and are a pleasure to use. So, now that my short walk down memory lane is over. We have established that modern multi-effects pedals and processors sound superb. But if you’re considering buying your first multi-fx, what do you need to take into consideration? Since we are discussing multi-effects pedals, it’s pretty obvious that they all feature a number of different effects. But the effects do vary from unit to unit and manufacturer to manufacturer. You will, therefore, need to filter them. Make sure they feature the effects you need for your practice sessions and gigs. Some products are quite simplistic. While others are loaded with a massive number of effects, designed to meet the needs of eclectic guitarists. If all this seems like a minefield of information you can make the process easier by not only considering the number of available effects but which ones you actually need. And how many of the effects you can use at the same time. 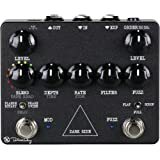 If you enjoy tweaking your sounds endlessly, you might want to look for a pedal that allows you to change the order of the effects. And, if you’re interested in taking things further, with enhanced control over them. Consider a pedal that either comes with or allows the use of external expression pedals. All multi-effects pedals come with guitar in and amp out connections. Some, however. offer a lot of other options regarding connectivity – such as line-outs, amplifier simulated outputs, effects loops, amp control, and digital outs, to name just to a few. The more in-depth the connectivity, the higher the price. If you’re considering buying your first pedal. A pedal featuring the basic inputs and outputs, as well as an amp channel control (If you have a multi-channel amp that is) should be enough. 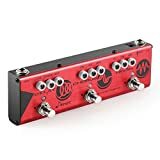 But, if you’re looking at getting most of your sound from the effects unit you might want to consider a product that offers far more in terms of connectivity. For example, if you don’t want to use an amplifier live or in practice sessions, you will need a pedal that features line-outs. These can be either be on balanced 1/4” or XLR outputs. Both options allow you to enjoy the high-grade audio experience you want. Some effects pedals offer different ways to digitally connect up your guitar rigs. Offering additional control through external connections. Whereas others function as audio interfaces. Allowing you to record into your computer without the need for other hardware interfaces. USB ports are often featured for plug-and-play connectivity and downloadability. MIDI ports are also generally found on high-end units. They are superb at giving you control over all of your effects and amp emulations. Either from a dedicated MIDI controller or a separate computer. S/PDIF connections are also sometimes included. Allowing you to digitally transfer the audio to your audio interface or to a compatible mixing desk. Effects pedals are small and tidy when used on their own. However, when you start stacking them all together on a pedalboard, things can get a bit cluttered. With multi-effects units, the clutter problem simply doesn’t exist. Everything you could ever need is packed into a fairly compact pedal. There are no multiple power supplies, miles of cable and pedals you can’t use properly. Because you had to put them on sideways because you ran out of room on your pedalboard. This small form factor also tends to be helpful on stage. Even though most professionals still prefer to use expansive pedalboards and much more complicated gear set-ups. A multi-effects pedal is a great way to cover all of your needs, especially for amateur and semi-pro guitarists. Although most multi-effects pedals are quite compact, others are not that small. Think of the situations that will use your pedal. Only at home? Home and practice room? Or playing concerts all across the country? If you intend gigging a lot, how will you be taking the multi-effects? Does it need to be small enough to fit in a back-pack? Does your band have a van with plenty of storage? The answers to these questions will make it easier for you to choose the right pedal. Let’s face it, multi-effects pedals get abused. Your standing on the edge of the stage looking at the gorgeous girl or handsome guy in the third row. But your so lost in their eyes that you forget that it’s time to change to that wonderful solo sound you love so much. And your 15 foot away from your multi-effects pedal. It’s time for some quick movements and some pedal board abuse, as you try and make the change in time. You want to be gentle of your effects pedal switches. But in heat of the moment, you come down hard. This is typical of live stage use, and many floor effects pedals and processors are built with this in mind. If you intend to use your choice of pedal live. Make sure its build quality will keep up with constant abuse at practice sessions and live performances. Look for durable units capable of standing the tests of time. To be honest, you need to be a rocket scientist to find your way around some of the more complex multi-FX pedals, if you’re not used to them. But, this is understandable. They are built for guitarists who want the immense sonic diversity and tweak-ability they offer. And have years of experience, navigating sub-menu after sub-menu. They know what sound they are looking for and how to get it. But, if you’re a beginner, these units will alienate you. And you might be far better of, opting for a design that is user-friendly. Making your new musical experience with effects, simple and enjoyable. You can always upgrade to something more complex when your skills advance and you get better at using effects. Now that we have covered what to look for when buying multi-effects pedals. Let’s discuss some of the more obvious and some not so obvious benefits of owning one. One of the more awesome things that most multi-effects pedals can do, is store preset, after preset, after preset. You can save all your favorite combination of effects on a single preset. And then instantly recall that combination, by clicking a switch whenever you want to. In simple terms, you can set up a number of different sounds – clean – clean with chorus and delay – rhythm – heavy rhythm – solo for example, as different presets and move between these as you need them in different songs. Or you can get more complex and set up whole songs across your multi-effects pedal. Allowing the songs intro sound, to be stored as preset 1, the verse as preset 2, the chorus as preset 3, the bridge as preset 4 and the lead sound as preset 5. Then it’s on to the next song and you have a completely different combination of effects stored as presets – 6-10, 11-15 or whatever. Despite the rapidly advancing technology used in multi-effects pedals. They are still one of the most cost-effective ways to get into guitar effects. If you’re just starting out on the road to rock ‘n’ roll superstardom and have a limited budget, you basically have two choices. A half decent multi-effects pedal, that will give you a variety of good enough sounds. Or a bunch of the cheapest effects pedals you can find. You may well end up using pedals in the future. But at this stage, it’s far better to have the ease of use of a single unit, with a large number of effects to experiment with. And a reasonable resale value, when you decide to upgrade. Multi-FX pedals simply give you the best bang for your buck, when you are at this stage. When you are just starting out, the actual quality of the effects isn’t the biggest factor. Your ears are going to take some time to adjust to the sound of your guitar, your amp and, your effects. Until you get familiar with all three. And can really hear the differences. You are much better off with an all-inclusive solution, such as a multi-effects pedal. Beginners often have problems with amplifiers, mainly through limited budgets. Even though practice amps are getting better all the time, not everyone has access to a decent amp. For those using simple solid state amps, a multi-effects guitar pedal can prove to be invaluable. They can make the worst sounding amps, sound a lot better than they normally do. If you are interested in recording your guitar (and in my opinion you should be, because you will learn, not only so much about the instrument, but also so much about your own playing, by doing it), you have a few different options. You can spend a fortune and build a professional studio. Spend quite a bit and build a half-decent home recording setup. Or not spend much at all and get a good multi-effects pedal. Recording your guitar parts and songs is easy with most of the multi-effects pedals that feature the option. The sheer number of effects these pedals offer is also invaluable when recording. Many of the sounds featured on them, are too far out, to use live with a four-piece band, but layered on your latest song, they sound amazing. Well, there you have, in my opinion, some of the best multi-effects pedals and processors available today, within the different prices ranges. Which is the best multi-fx is a very difficult question because as with most things, it is very subjective. If for example, you want a high-end, great sounding multi-FX processor, which is really easy to use than the Headrush Pedalboard is the winner. If however, you want amazing sounding effects, but don’t need a chorus, a delay, and a reverb on every song and don’t want to spend a fortune. Then the Eventide H9 could be the perfect effects pedal for you. My personal favorites are the TC Electronics G-System, The Eventide H9, and the Keeley Dark Side for the reasons stated. But I’m not your typical guitarist. And in many ways, the Line 6 Helix LT, the Boss GT-1000, and the Headrush are the best all-round multi-effects processors. Suitable for most people after a higher-priced unit. With the Boss GT-1 and the Zoom effects, the best options in the lower price ranges. How much you want to spend is, of course, your decision. And please take note of the pros and cons of each unit and the recommendation on what type of guitarist it would best suit. But I can assure you, whichever one you choose, that you will not be disappointed.